ORGANIC CINNAMON FRENCH TOAST / BREAKFAST RECIPE. 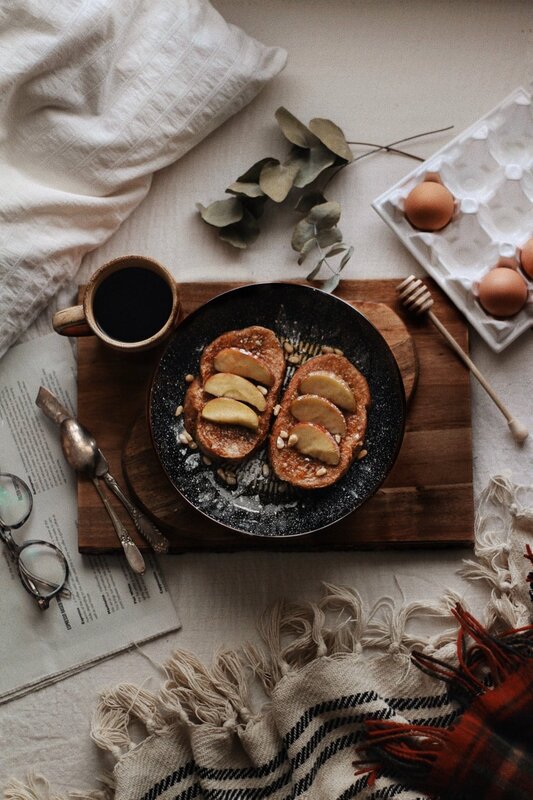 This weekend I had the perfect chance to have a cosy slow morning in and make a new breakfast recipe that I can't believe I haven’t tried before– Cinnamon French Toast! I’ve been wanting to try to eat fresher and more organically wherever possible as I’ve heard so many good things about how much better for the environment and wildlife it is. The new year, for me, often means trying new things & starting new routines and this is definitely one of mine! This french toast was made with almost all organic ingredients (my tiny local supermarket didn’t have organic maple syrup which I had to include!) and makes the perfect weekend breakfast so I’ve left the recipe below for you! Handful of whatever fruit you want to top your toast– I went with my favourite cinnamon and apple combo but you can add whatever fruit you’d like– mixed berries would also work great! Mix the eggs, milk, sugar and seasonings in a large bowl untill thoroughly combined (the spices will rise to the top of the mix when resting so don’t worry about this too much). Heat a teaspoon of oil into a large frying pan over a medium heat (if your heat is too high then you will cook the outside of the French toast but the inside of the bread will still have areas of raw egg mix, which nobody wants!). Meanwhile, place a slice of bread into your egg mix and leave to soak on each side for around 3 minutes each. Depending on how large your frying pan is you can cook 1 or 2 slices at one time frying on each side untill lightly golden. For a little extra sweetness and browning, sprinkle a little extra coconut sugar onto the slice when frying. Meanwhile wash and prepare the fruit. When all the toast is ready then simply top with the fruit, sprinkle a light dusting of icing sugar and drizzle over some syrup. Enjoy! The recipe is based on this one originally from the Organic UK / Feed Your Happy website and you can find this and more recipes here! NEW YEAR, NEW PLAYLIST / WINTER 2018. 9 GOALS & THINGS TO ACHIEVE IN 2019.